Since Tom and I, as well as most display bikes, will be at the Handbuilt Bike Show, the VO showroom will be closed from Wednesday through the following Monday. Our trusty staff will ship all web orders as usual. Technical question, however, might not be answered promptly. These little racer guys always make me smile. I thought I'd post a few photos that some might find interesting. 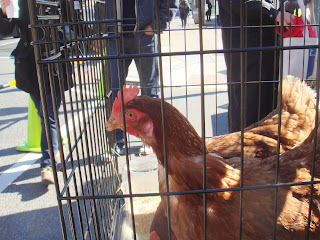 The first few are from last Sunday's farmer's market in Washington DC. There were some interesting bikes there. 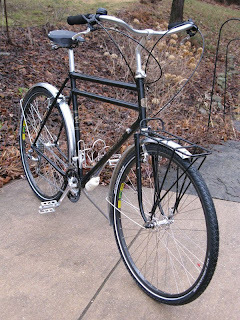 Marty sent some photos of his Bombadil which has a couple of interesting features. Those are VO Zeppelin fenders, which look great over the 40mm tires. And he did a neat job adapting an old Blackburn rack to fit on the front. 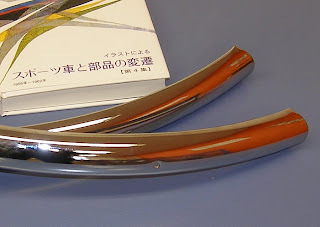 John sent this great photo of Zeppelin fenders he polished, 20 minutes per fender with Simichrome. The rest of the bike is pretty nice too. We received some shiny prototypes yesterday. These rims may become a new VO product. They are double wall and fully polished. I really wanted a classic-like rim that was as strong as a modern rim. They will have eylets, though this sample pair has not yet had them installed. The joint is pinned, not welded, but it is very smooth. On the down side, they are a little heavy at 550g, though they should be very strong. We can have them made in both 650b and 700c, 36h and 32h. 650b tires mount perfectly; no sizing issues like some recent rims. The generous 24.5mm width is ideal for 28mm to 45mm tires. Price would be just under $50. We're still looking at a couple of other options, but I like these rims a lot. The plan would be to sell them as plain rims and built up as stock wheels, maybe laced to Shimano 105 hubs at first and to internal geared hubs later. A few weeks ago I mentioned a new finish on some VO fenders. 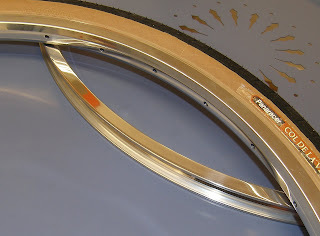 The photo shows a new 38mm (for tires to 28mm) VO alloy fender. It's not polished, but rather chrome plated. This means that it weighs only a few grams more than out regular fender, but is even more scratch resistant than our stainless steel fender. 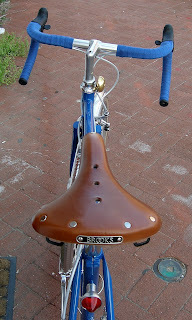 We are not exactly sure of the cost yet, $10-$15 over standard VO fenders. Is it worth the premium? Also, we now have those digital calipers I mentioned a while ago. Many of you asked us for 17-degree version of our super popular VO Stem. They just arrived! A 17-degree stem allows a traditional drop, that is the stem is parallel to the ground. Inverted it provides extra rise for folks who want their bars up high. You can better see the rise/drop on the stems mounted on VO Stem Adapters in the photo. We have them in 80-110mm and will probably add 70mm and 120mm in the next production run. 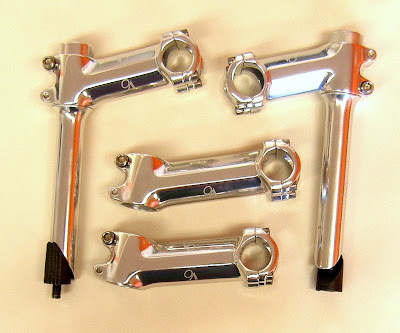 We also got another shipment of the original 6-degree VO Stem. So all sizes are in stock again. The Grand Cru long-setback seat posts are also back in stock. 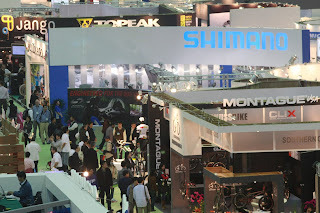 I just booked my flight for next month's Taipei International Cycle Show. This is the most important bike show of the year. It's the place where you can find almost anything related to production bikes. 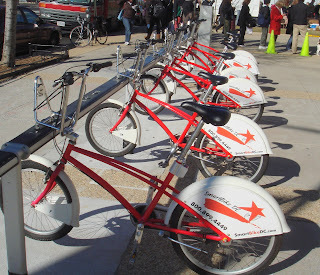 Everything from trikes for toddlers to TdF bikes to work bikes will be on display. The volume of components and accessories manufacturers simply boggles the mind. And if you can't find what you need, you can certainly find a factory to make it, just so long as you order enough of them. Tom and I will spend four days at the show, mostly meeting with manufacturers that make components for us. We'll also be looking for new items to import. After the show we plan to visit four factories that make some of our products, including a new factory that will make stainless steel racks. This post is here so you can tell us what we should look for in Taipai. But please be realistic: a VO folding lugged titanium fixie camper won't happen. Despite the economic slowdown, VO is growing. The winter slowdown we were anticipating has not materialized. And our tiny staff is increasingly overworked. So we need help. The position available is entry level. It involves grunt work in the warehouse, packing orders, helping customers in the showroom, and even testing new products. Pay is about what you'd expect in a bike shop. If you live in the area and are interested, please e-mail. Unfortunately not everyone is doing well in the current economic climate. Johnny Coast, who builds many of the Velo Orange frames for us, will be unable to continue supplying custom frames to VO and to our customers. The credit crunch has hit Coast Cycles rather hard. Of course we're refunding deposits on ordered frames and those in the shop will be finished. Johnny tells me that he is reorganizing and will try to keep Coast Cycles open as a smaller, leaner, and more expensive shop. I've heard of other builders who are in deep trouble as well; it's not a good time for many artisans. Velo Orange Pass Hunter and City frames from Ahren Rogers are not affected. They continue to be available and are shipping close to schedule. We won't look for another builder right away. Custom frames are something I do want to offer, but the return on them and the amount of time required makes it hard to justify. 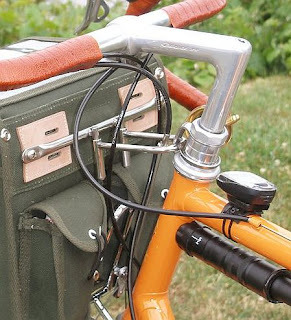 The rackaleur allows you to carry a traditional handlebar bag on just about any bike with a quill stem. 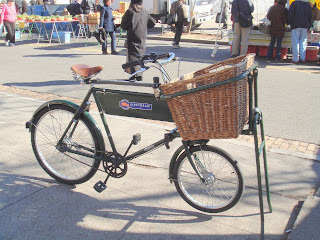 Of course the weight is high and on the handlebars which is not ideal, but I've found that with light loads it's fine. That case of new-old-stock rackaleurs sold out very quickly, but I kept one for myself. And I've been thinking that they should be made again. Is anyone interested? I've been thinking about bike computers. 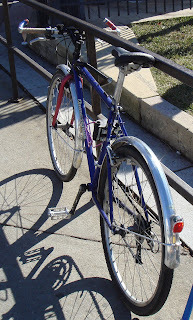 Over the years my bikes have evolved, gaining many useful bits such as fenders, front racks, and lights. Like many of you I've gone from riding, mostly, racing style bikes to riding a randonneuse and a city bike. One thing my bikes have been losing is computers. As the batteries died the computers were removed rather than fitted with a new battery. It probably has to do with age, but I no longer care much about how fast I am going or exactly how far I have ridden. I've lost my log book too. Now I'm not totally against cycle computers. They are OK for navigation. I still have one on my go-fast bike to make it easier to follow cue sheets on group rides. But, come to think of it, it's battery is dead too. Maybe even the navigation thing is overstated. When we went touring in France a few years ago Annette and I managed to find our way from remote place to even more remote place for a week with nothing more than a map, no bike computer or GPS. If all else fails, we ask directions. So, do you use a bike computer? 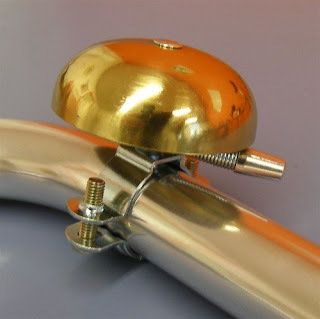 Tom found a very nice, a fairly inexpensive brass bike bell from Taiwan. We call it the Temple Bell, though I admit that in my several visits to Buddhist temples in Taiwan, I've never seen a bell remotely like it. But allow us a bit of poetic license; it's hard to think of all these product names. Our rationale for yet another bell is that Japanese prices are increasing at an alarming clip while delivery times are lengthening. So having bells from more than one manufacturer seems only prudent. 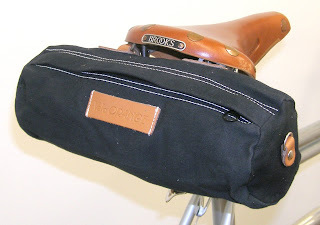 VO Croissant and Baguette Bags are in stock again. They are made of "dry-waxed" canvas with leather trim and piping. That leather piping and edging is a big deal. I think it is really classy, but it was hard to get. The new version of the Baguette has a third strap that can be attached to your stem or seat post. A light can be clipped to the name strap. How do they compare to the old ones? I think the fabric is better. The leather is maybe a tiny bit lower quality, but there is more of it. The stitching is about the same. The buckles are nickle plated steel instead of brass; this is a trade off, but I much prefer the silver look. It has a stiffener in back to maintain its shape and a separate pocket for your wallet. There are inner flaps that can be secured to keep the contents restrained on rough roads. The trim and straps are leather. It's about the perfect size for a long day's ride with room for a tool kit and spare tube, a rain jacket, a wool cap, knee warmers, a small camera, a cell phone, and plenty of snacks. If your rain jacket gets wet you can secure it under the extra long top strap. Despite the volume it's fairly narrow and tapered toward the bottom so it won't rub you legs. 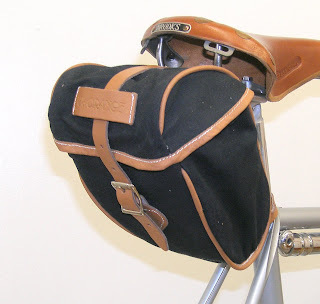 We recommend attaching it to the saddle rails, rather than saddle loops, as this minimizes swaying and keep the bag low and out of the way. A rear light can be clipped to the name patch. Dimensions are about 16 x 23 x 14cm (w x l x d). 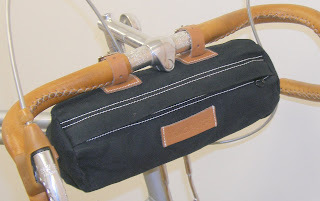 Our VO baguette is a saddle bag and a mini handlebar bag. 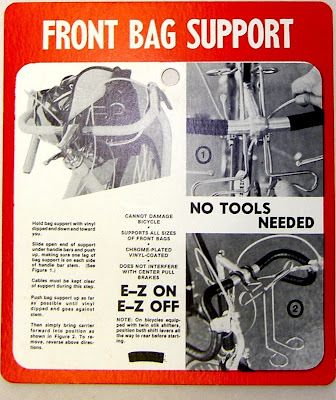 This is one bag that serves both purposes; the straps are spaced to allow it to hang on either end of your bike. 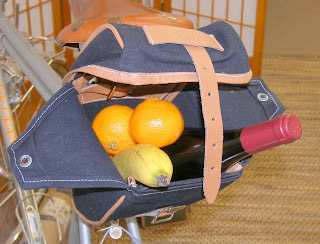 It's big enough for a Quicker pump, rain shell, tools, tubes, a banana, a wallet, and even a camera. Or just take a baguette (broken in half). 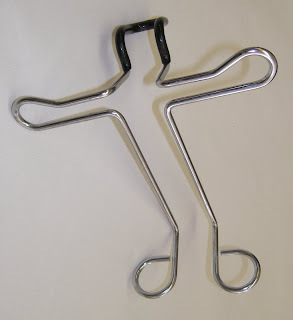 It's about 30cm x 11 cm. Finally, you may be pleased to learn that the new bags cost less than the originals. The Croissant bags have gone from $68 to $55 and the Baguette bags went from $39 to $34. We've received a large shipment of both models so VO Imports can finally offer them to other shops. 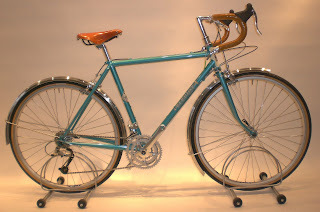 The 2009 North American Handmade Bicycle Show, to be held in Indianapolis, Indiana, February 27 – March 1, 2009. If you want to see the work of, and chat with, some of the very best frame builders in the world this is definitely the place to be. 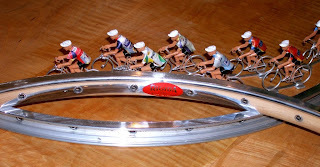 Velo Orange will be in attending as a component manufacturer; we have a double width booth. While we will bring a few complete bikes, most of our display will consist of Velo Orange and Grand Cru components including racks, stems, BBs, brakes, luggage, etc. But we won't be bringing any items to sell. Here are a few photos from a past show.